Grevillea acerata is a short shrub that is usually about one metre tall. Young growth is light green and mature leaves are linear, green above and whitish below. Each leaf is crowned with a prickly point. Clusters of flowers are carried on the ends of branches. Blooms are hairy and an unusual pale grey-pink and white colour. Flowering is profuse between June and December. Sporadic blooms may appear at other times. The flower appearance and colour is similar to the well known hybrid G. “Evelyn’s Coronet”. Keep plants bushy and blooming bounteously by regular light pruning. 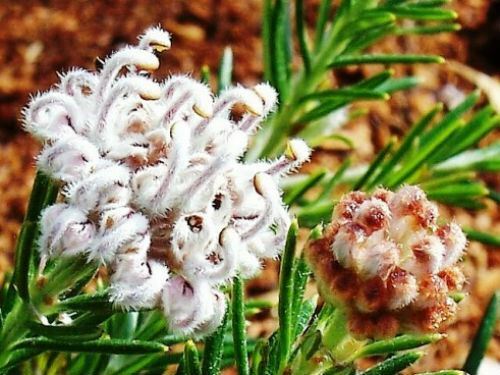 Grevillea acerata is closely related to Grevillea sphacelata and Grevillea buxifolia. In fact initially G. acerata was included with G. sphacelata. This attractive small plant is a rare species confined to Gibraltar Range National Park, east of Glen Innes on the Northern Tablelands of New South Wales. The species name means lacking horns and refers to the end of the style.